This is a review of the product Hair Formula which has been manufactured by DasGro. The manufacturer of this product claims that it contains twenty four active ingredients that can activate the old and inactive hair follicles and supply your scalp with the required nutrients and as a result initiate the regrowth process of the hair. Read on to learn more about the ingredients of this product as well as our opinion of whether it is the right product to take for the growth of your hair. The recommended dosage of this product for adults is 2 tablets a day with water and food, one in the morning with breakfast and the second in the afternoon with lunch. It is advisable to not take more than two tablets a day. DasGro Hair Formula contains only natural ingredients without any chemicals so the side effects of this product are rare and minimal. So if you don’t exceed the recommended dosage then this product is considered safe for long term use. However, in rare cases an individual may turn out to be sensitive to any of the ingredients of the product and in such a case you should contact a doctor immediately. The price of one bottle of this product containing sixty tablets is listed as $39.97 on the company’s website. The manufacturer also offers a discount of $92 as well as free shipping, if you order 6 bottles of this product. The manufacturer of this product offers a hundred percent money back guarantee. So if you are not satisfied with the product and you feel that it is not showing the desired results then you can get your money back. The manufacturer has specified that you have up to ninety days to return it after purchase. The product has over 700 reviews on Amazon which are mostly positive. Hair Formula by DasGrow is a product that can be used by both men and women with all hair types and it contains twenty four natural ingredients including green tea extract as well as Saw Palmetto which can hinder the growth of a hormone known as DHT which is directly responsible for hair loss and thinning. It also has other ingredients like zinc and biotin which can improve the color, texture and shine of the hair. It is free from starch sugar and artificial preservatives and comes with a ninety days money back guarantee. However, it is not intended to be used in any way to diagnose, prevent or treat any disease. 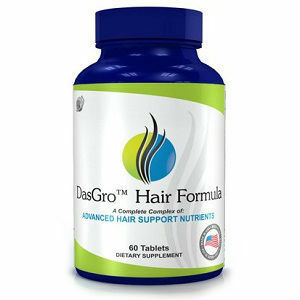 John Brownstone	reviewed DasGro Hair Formula	on July 29th	 and gave it a rating of 3.5.